Buyin g a new home is an exciting time. It can also be stressful! Take some of the stress out of your home buying experience by using a home inspector. They can alert you to possible issues with the house which you will want to be aware of – for future problems and also possibly to use in negotiation with the seller. After all, you wouldn’t want to buy a home with major foundation damager – unless you knew it upfront and were able to purchase the property very inexpensively. Are you a Licensed Professional Engineer? These types of individuals are regulated and licensed by the state. 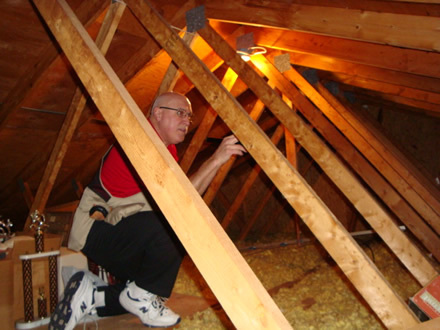 In some states, home inspection is not regulated and anyone can become a home inspector. How long have you been a home inspector? Someone who has performed hundreds of home inspections vs. just a few will have a deeper breadth of knowledge. They know what to look for and just have more experience. What are your or your company’s professional affiliations? These affiliations can help show the credibility of the company. Can I attend the home inspection? You will learn a lot about the new home, it’s possible problems and at the very least, the location of any issues or major systems. New home owners can learn a lot from a home inspection. What tests do you perform for lead, asbestos, mold, radon, etc.? You want to know if there are any major problems but these items are not always covered. Sometimes they are covered by a visual inspection only. If these are important to you, then ask (and possibly pay) to have them covered. How much? When the home inspection report is complete, ask them to give you what they feel an estimate would be to have an issue repaired? This can save you some time by getting a general ballpark idea of a cost without needing to send out for additional estimates for the work to be completed if you are considering still purchasing the property and/or negotiating a new price or concession. Most home inspectors are more than happy to work with you for any of the above questions or concerns. Take the next step in buying your new home by completing your home inspection!